The X offers the style and sophisticated features of the classic 500, but in a grown-up package that’s bound to take you on a joyride. Style lovers and thrill seekers, brace yourselves. X is bigger. X is bolder. X is beautiful. Like the 500, the X is distinctively elegant, but this compact crossover is ever ready for the open road. Now with 5 doors on a more powerful frame, the X is designed to take you beyond the city limits, its sassy chassis built to withstand a bit of rough terrain while maintaining its signature composure. Off-road-look bumpers with protective shields, striking rims, roof rails, AND a satin-chrome finish? The 500X won’t compromise on excitement or exquisite looks. With a car that came in the top 3 of the Most Beautiful Car of the Year Awards 2014, you know that together you could rule the roads. They say opposites attract. But in the case of the Fiat 500X you’re enthralled because, frankly, it reminds you of you. 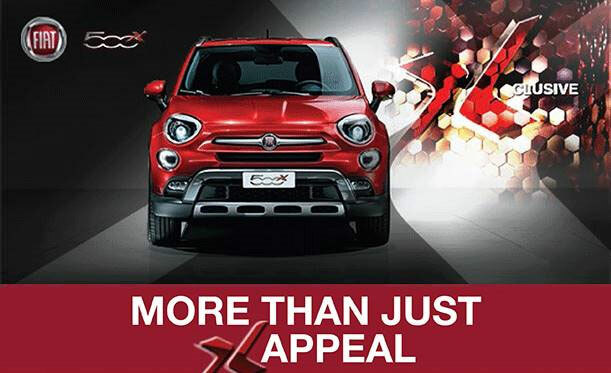 Exclusive to William Simpson Cars, the Fiat 500X will be available soon. Contact us now to be the first to discover.